Preface: This is early beta. Things will change before release. 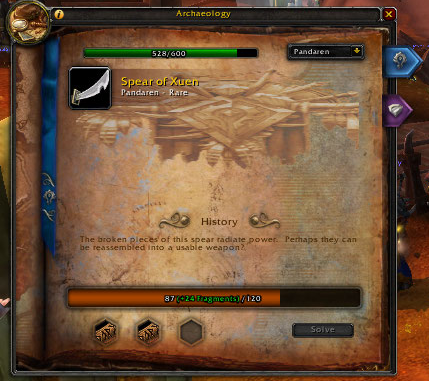 Archaeology (along with fishing) is one of the only professions that is working in the past level 85 world of Pandaria. 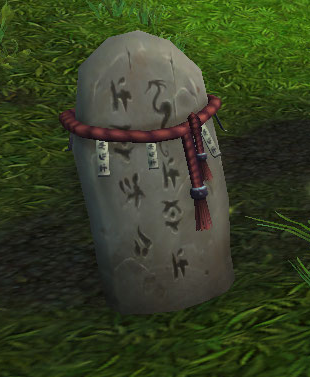 Blizzard has hinted about changes coming to Archaeology that make it less grindy and more fun. None of those changes have been implemented yet. 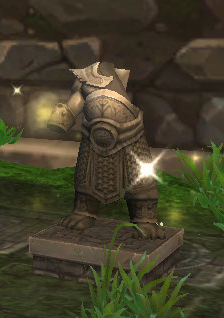 We have two new types of artifacts we’ll be digging for, Pandaran and Mogu. Remember how, in the past, you could only dig three times in one dig site? Well in order to speed things up that limit has changed. Now you can dig up to six times on one dig site. Each time you dig you can get up to 9 fragments. Even though the promised improvements haven’t been implemented yet, we do have a bunch of new artifacts. We do have the equivalent of “Troll tablets” etc. 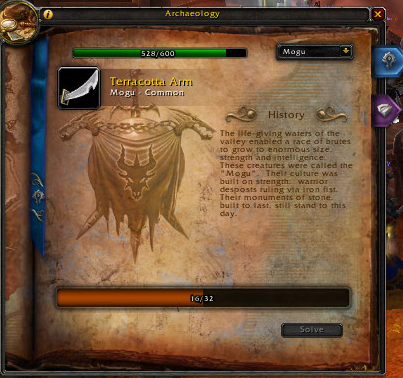 to help us piece together artifacts more quickly. 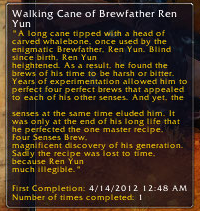 The Pandaren version is called an Oracle Bone. 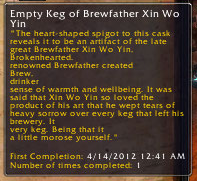 I wasn’t able to get any of the Mogu version. Solving each common artifact gives you ONE point of archaeology skill. A rare will give you FIVE points. I made it up to 527! And of course, as is the way with such things, I was working on a rare when I ran out of dig sites in the open zones. So now I have to wait until more zones open up to finish it. Grrrrrrr! Cymre reports that sometimes when you dig you might stir up an Ancient Haunt that attacks you. This must be pretty rare as I didn’t experience that.